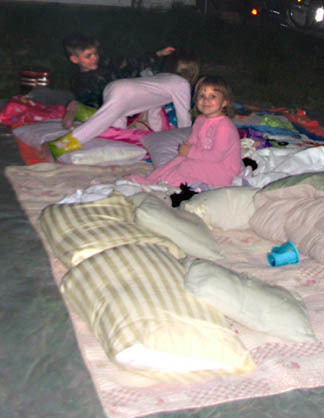 Since the weather turned nice around here, the kids have been agitating to camp out in the backyard. Not to be discouraged by the fact that we haven't unpacked most of the camping gear -- including the regular sleeping bags or the tent, they wanted to sleep outdoors. The other night was clear, cool, but not cold and perfect for spending the night in the backyard. So we moved slumber bags, extra blankets and the port-a-crib all out to a large plastic dropcloth (all our tarps being either in use or shredded by excessive use), lit a fire, sang songs told a few stories and turned in for the night. I'm sure the people next door had been hoping we would be the normal neighbors, but no such luck for them. In the morning we woke covered with dew and the older of us (without young, flexible muscles and skeletal structures) were rather stiff and tired, but it was agreed by all that the camp out had been a success. I'm not saying I wasn't yearning for my nice, soft bed at times, but nice, soft beds don't always leave the memories that campfires and nights under the stars do, even if they are more comfortable. Where were the fire ants? You'd all have been killed in my yard. That sounds like SO much fun. You have some lucky kids. I don't think we have any fire ants yet. Thank goodness. I was hoping that the garter snakes weren't roaming around yet, because I really didn't want to wake up to one staring me in the face. Do we have fireants in this area? I've been hoping not. What a good sport you guys are...I might have decided it was too much trouble with all of the camping stuff packed away. Your kids will have great memories of those kinds of nights.